My bother Martin Cooney is currently studying robotics at Osaka University in Japan. He just finished his Master’s with flying colors and is now working on getting published and possibly a doctorate! Quite impressive! Martin’s Master’s thesis is titled “Recognition of ‘full-body gestures’ using inertial sensors for playful interaction with small humanoid”. 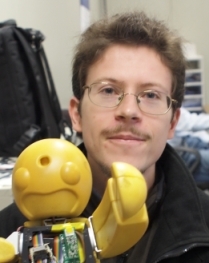 He is constantly working on new and interesting projects and enjoys building robots as a hobby. One of his undergraduate computer science projects was quite interesting as well. He was working on modelling group dynamics among Wolves and Muskoxen in a research topic called “Wolf-muskox interaction in the Arctic (Wolves red, Muskoxen brown, lake blue)”. His project was written in c++ and was quite interesting from both a code perspective as well as from the perspective of the rules involved surrounding individual sprites behaviors when part of a group and how this affects the group as a whole.